My finger is better so I can type a little now!! But the really good News Is we received the latest test results for Steve and they are Excellent!!! He is receiving his radioactive treatment today and then another body scan next week and that should be it!! My mom is also doing great!! Thank you everyone for prayer!! I know it worked!! 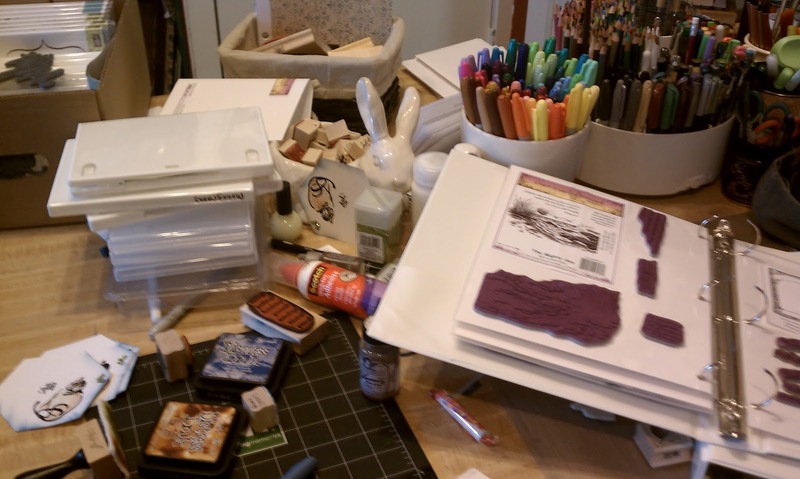 In anticipation for having a whole day alone, I started a big project, I am taking all my "word" stamps of their wood mounts and making them clings and reorganizing all my cling stamps. So that is what my pictures of my work desk show today! That and a few pieces of my cat mingle swap project. I love my wooden stamps and could never bear to unmount them, no matter how much space they take up! I like handling them too. Hope everything is going well for your Mum and your husband, hope they both continue along the path to recovery. So glad that all is looking up, lesser gals would have not coped witht he finger being the final straw! Well done you. Even typing is exquisitely painful with such an infection. I understand all your reasons and logic, but I'm horrified that you're unmounting your beautiful stamps...But good luck with the work, I expect it'll take a while! I'm very glad things are looking up for you all. I'm intrigued by the unmounting of your stamps - I think this would encourage me to use them more but looking at the other comments it's either horrifying or genius! That's a big job, unmounting stamps! I peeked at your lastest card, you certainly have been putting your beautiful cat stamps to work! Love your workdesk, keep on creating! Oh my goodness, that is quite a job. 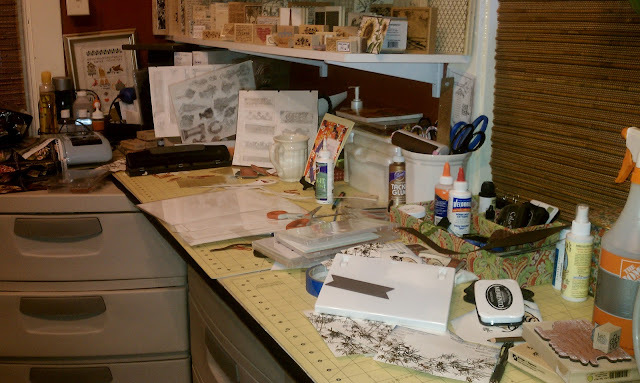 I am slowly doing the same to all my wood mounted stamps. Glad to hear good news all round about the healthof your family.